If you have brains, use them. If you have skill, apply it. The world must profit by it, and therefore you. Your talent can take you to any height as long as you keep building and developing it daily. It may be delayed but can never be stopped, until you quit. If you are strong & talented, you do not need to run around and tell everyone about it. It speaks for itself. Work hard in silence. Let success make the noise. 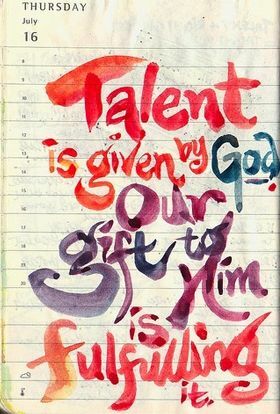 We are all blessed with certain talents and certain skills, and what someone else has, should never make us jealous, but instead should ignite our own flame for life. Do not allow anything to make you feel that you do not deserve the success you want. Every success is within your reach, it is matter of belief & action. Talent and good education is what makes an excellent student, but don't forget an amazing teacher. Growth is that fusion of Talent and Hard work that work as a deadly combination when introduced together. Skill reaches the ceiling, talent reaches the mountaintop, excellence reaches the sky, but genius reaches the stars. As human beings, none of us are perfect and none of us can do everything by ourselves. Everyone has limitation. How one makes his weakness as a source of strength is what matters. No matter how talented you are, there is almost always somebody who can do something better than you. Look to those who are better and consider the potential for improvement.